The summer capital of the Indian state of Jammu and Kashmir, Srinagar is situated in the Kashmir valley on the banks of the Jhelum River which is a tributary of the ancient Indus River. While the origin of the town is debated, it was said to have been under the rule of the Mauryas, Kushan, Huns, Mughals and eventually, in the hands of the British. 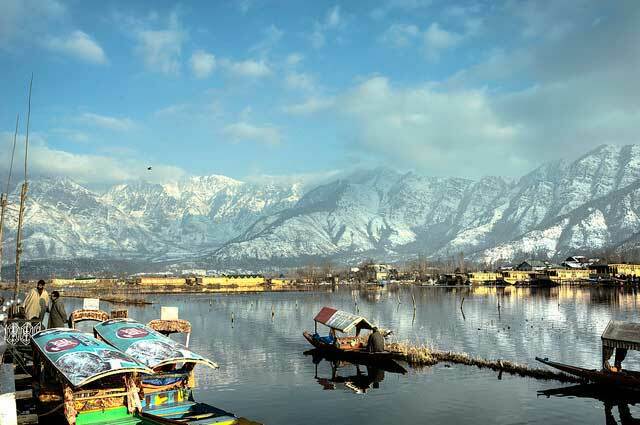 The city being a major stronghold of the Kashmiri culture is located at an elevation of 1600 meters above sea level and is also nicknamed as the Venice of the East. The city is surrounded by lakes and rivers and is famous for its handicrafts and arts. Srinagar is India’s top tourist destination if you’re looking for a taste of the most elegant of cultures. The various temples and places of worship also make Srinagar a well visited tourist spot. The lakes and the various gardens built during the Mughal era enhance the town’s already picturesque beauty. Due to its high elevation, Srinagar enjoys a temperate but humid subtropical climate. Nevertheless, the climate stays cooler than most regions in India. The months between mid-February and April receive the most rainfall. The months from mid-July till late September are usually the hottest and the driest with temperatures upto 30 degrees Celsius. The seasons from October till med-February are the coldest with heavy snowfall and can cause roadblocks. Being the summer capital of the state of Jammu and Kashmir, the best time to visit Srinagar is usually the summer months between March and June when the climate is the most pleasant. The daytime temperature never goes beyond 25 degrees and nights can be mildly chilly. Nevertheless to experience the best of the hill station destination with a colder climate, the best time is considered as the months between October and December. Often called the Venice of the east, Srinagar is located around the shores of the Jhelum River and the Dal Lake. The boat markets, the house boats, and the surrounding valley with magnificent views of the Pir Panjal Range of the lower Himalayas. The colonial houses, the Mughal gardens, with several spots for adventure sports, Srinagar is a visitor’s haven. Srinagar is also famous for its handicrafts that have been produced since thousands of years and are famous all around the world. Mughal Gardens, Dal Lake, Shikara Houseboats, Pashmina Shawls, Sher Garhi Palace, Nagin Lake, Chashma Shahi and Jawaharlal Nehru Botanical Gardens etc. are the major attractions that every tourist must visit in Srinagar. Due to the political unrest between the Indian and the Pakistan government, Srinagar’s popularity has stooped in recent years; nevertheless, the town is one of the most picturesque hill stations in India. There is just one road that leads into the town and can be blocked due to avalanche and heavy snowfall during the winters. Taxis and Buses are available from Jammu and Leh. The Srinagar international airport is well connected with flights available via Delhi and Mumbai. The Srinagar Railway station is well connected to all the major railway stations in India. The newly constructed 11 kilometers long tunnel facilitates an easy and picturesque entrance into the city. Being a tourist town, Srinagar houses a vast range of lodging and accommodation facilities with several luxury hotels to budget guesthouses and inns. The best way to get around the town is by using the Shikara boats. Auto-rickshaws and taxis are available throughout the city and motorcycles and scooters can also be taken on rent. Private buses can also be used for cheap and easy travel in the city.